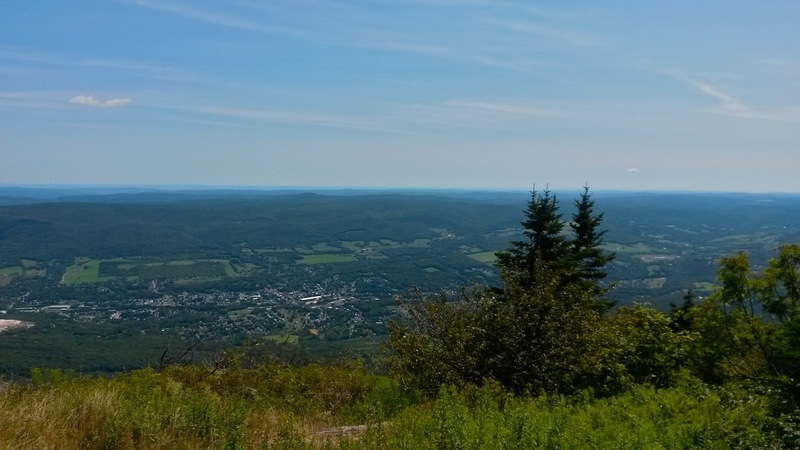 Berkshire Hiker: Mt. Greylock—Views & Motorcycles! Labor Day weekend I climbed Mt. Greylock by the Jones Nose Trail and the Appalachian Trail to the top and returned on the CCC Dynamite Trail. Whenever the summit road is open, usually from May through October, you have to share the top with those who drive, bicycle or motorcycle to the top. At the Visitors Center, we met two bicyclists who said they were going to peddle over the top to Williamstown, peddle back over the top to the Visitor's Center and then back over the top to Williamstown again. Wow! I'm impressed with the many people who bike to the top and back down once! They looked like they were up to the task. When the weather is beautiful like it was that weekend, motorcyclists love the mountain. There may be hundreds at the top. Actually there's plenty of room for everyone to enjoy the views, I just wish the motorcycles weren't so loud! One of several long lines of motorcycles parked below Bascom Lodge. The beautiful pond just below the summit. This is just one small portion of the long views at the top. Sorry, but this photo just doesn't do it justice.